This week's colourQ colours are really gorgeous. I see myself using this colour scheme again and again. I don't have any Stampin' Up colours but I find that my PTI colours are usually a close match. I used Ocean Tides and Hawaiian Shores instead of Island Indigo and Tempting Tourquoise. At first I wasn't sure how these two blues could work together but they actually blended quite well. I made a wedding card to get ahead for this years round of weddings. I started with a card base of Hawaiian Shores which I matted with a patterned paper from PTI's Beautiful Blooms. This paper pack features the colours Hawaiian Shores, Pure Poppy and Simply Chartreuse. My centre white panel was embossed using PTI Simply Stripes Impression Plate. I matted a quote stamped in Ocean Tides from Love & Marriage with Pure Poppy and created a felt blossom using Ocean Tides felt accented with leaves from Sending You in Simply Chartreuse. Hope everyone is having a fantastic weekend. This card is gorgeous. I love it so much. How did you make that felt flower? I just love it. I think I need to get some of that beautiful blooms paper. Every time I see it, I swoon just a bit. Beautiful card. The felt flower is stunning. And the sentiment is so unusual, but perfect for a wedding card! Thanks for joining us at colourQ! Beautiful card Tracey! LOVE that felt flower!!! The sentiment on the inside is really pretty! LOVE this Tracey. The PTI paper is perfect for this weeks colors. And you flower..oh my..so pretty. Glad to hear you survived your visitors. Thanks for joining us again this week at the ColourQ. Great card ~ your Beautiful Blooms patterned paper really pulls all of the colors together ~ I LOVE your felt flower! Oh, Tracey, I LOVE what you have done with these colors! The patterned paper is perfect, and your selective inking of the stamp came out wonderful! I love that felt flower, too! Oh Tracey the lucky bride & groom to receive this will be thrilled! You've used the colors beautifully and your flower looks wonderful! So, so, so beautiful. I would have never paired that patterned paper and that stamp set together, ever and you make it look like they were made to go together. You sure have a way with colors, this is so fabulous and amazing. I will be making one of these, just like yours. Thanks for the inspiration. Normal :) I love it! This card is gorgeous...actually reminds me of the patterned paper that PTI sold a few years ago. Stunning use of the colors and I love the gorgeous felt flower. Your card is lovely, Tracey, your stamping is perfect! 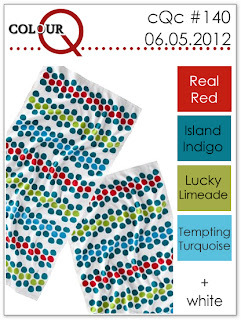 So happy to have you join in the fun this week at the ColourQ. Just gorgeous....the paper, the flower, the sentiment....just gorgeous! Love the way you used the colors, Tracey! And that loopy flower is super-cool. The new stripe embossing panel adds a lot too! This is gorgeous, Tracey! 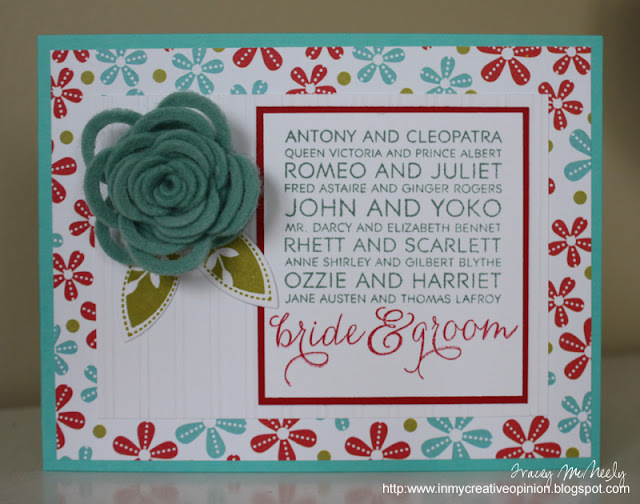 Love how you used the colors and created a fabulous wedding card! Gorgeous love it! Love the pretty rolled flower and the beautiful colors. So nice to hear the group of young men had such good manners. Love your card!